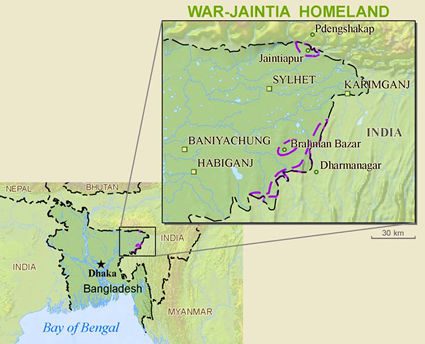 The War-Jaintia belong to the wider Khasi ethnic group, but speak War-Jaintia. 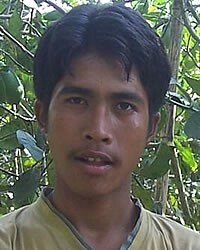 They live in isolated and scattered hilltop villages throughout Sylhet division in the areas that border India. They do so partly to be separated from the Bengalis who differ from them ethnically, religiously, and culturally, but also to be closer to their livelihood: the betel nut leaves which grow deep in the hilly forests. Nearly 100% of the War-Jaintia — men and women — are involved in the cultivating, harvesting, and selling of betel nut leaves. Almost as high is the percentage of Christians among them. There has been great response to the gospel since missionary work began among the Khasi people in the 19th century. Most belong to the Presbyterian Church or, to a lesser extent, to the Catholic Church. However, nominalism and materialism seem to have weakened the War-Jaintia church. Also, a lack of full-time Christian workers and a decrease in missionary activity among the War-Jaintia have contributed to the weakening. A low literacy rate is another cause for the lack of spiritual vitality. Because the War-Jaintia as a group cannot read the Bangla Bible or the standard Khasi Bible well, it is difficult for them to grow as disciples. They are proud to say that their people are almost all Christian. They and other ethnic Khasi members have been Christianized for over 100 years. There are several denominations (Presbyterian, Catholic, Church of God, and Baptist). Most medium- to large-sized villages have a church from at least one, and usually two, of these denominations. Is The Word Of God Translated? The War-Jaintia would say yes, but actually, research shows that the language of the Bible (standard Khasi) is quite different from their mother tongue. The literacy rate is 40-60%. It's difficult to know what percent of the War-Jaintia are literate enough to understand the Bible in either Bangla or Standard Khasi. Missionary activity has decreased significantly among the War-Jaintia. To inject new life and energy into the War-Jaintia church, teaching and training of pastors and lay workers would be especially helpful. It would be great to see the church leadership energized and mobilized, and a new generation of leaders/pastors trained. Also, they need Scriptures they can understand. * Pray that they would have a hunger for God's Word, and a personal commitment to Jesus Christ. * Pray that materialism would be replaced by a passion for God and they would take specific and sacrificial steps to gain access to Scriptures they can understand. * Pray for protection and growth of the young generation that is growing up without a strong church, and without strong Christian role models. View Jamatia in all countries.